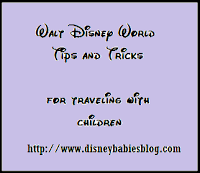 Disney Babies Blog: Trip Planning Woahs! I have several "woahs" for my next Walt Disney World vacation. #1 - It's over 300 days away! With baby #2 due in less than 6 weeks, we're not going to take a 2nd trip this year! #2 - The real question: Where to stay! For the past 2 Marathon Weekends, we have happily stayed in a beautiful and roomy (3 bedroom/3 bath w/ private pool) villa off property, located ridiculously close to WDW. We rent our own car and don't step into the parks (other than for running) until the Sunday after the races, even though we arrive on Thursday. And, for under $100 a night (yes, less than $100 a night for our own bedroom, bathroom, and full kitchen), it's been hard to even think of another option. We travel with our son - next January with our 2 sons and meet my parents there - so we need room for 4 adults and 2 babies. PLUS - we can't really share a room with the boys when we have to be up and out at 3 am for the race! My parents aren't the quietest of people, so having them share a room isn't really an option either. But - this time, we're thinking we'll stay less than a week - which adds fees to staying in a villa. And, we'd love to just do Magical Express and avoid traveling with 2 car seats. Renting a 2 bedroom at $12 per point at AKL is $1620 for the 5 nights - not terrible! OR My dream resort - the Boardwalk 2 bedroom would be $1920.. not too shabby. And, being closer to parks, it's a more convenient location. Buy DVC!! (resale of course) But renting would be my second option. We love having the space. If it's only $100 a night why not book the villa you love for a whole week $700 and not worry about the nights you won't be there. Seems it would save you plenty of money! Since you mention the Magical Express I'm guessing you're flying in. When renting a car for just those few days you could always just add the price of a car seat rental and not have to lug those big things around with you. Just booked our 1st ever vacation on property (for the free dining) but stayig off has so many advantages! Renting car seats is very expensive. I feel like it would add $50-100 a day for 2 kids! It is so easy for me to spend other people's money, so I'd say go Boardwalk :-). But seriously, with two little ones, you can't beat the location and the space will be wonderful! I know we didn't pay that so I just looked it up...Renting 2 in Orlando from Budget came to a total for $104 for the week. Yes it's more then bringing yours from home but if you don't want to deal with it that $104 may be well worth it!